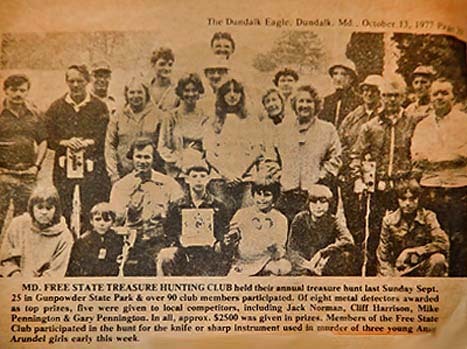 The Maryland Free-State Treasure Club welcomes beginners, advanced metal detecting enthusiasts and guests who are curious about the hobby but don’t own a detector. We are a multigenerational club where family members are welcome to attend meetings. We offer memberships to adults 18 years of age and older and single memberships 17 years of age and younger. Meetings are held at 7:00 PM the last Thursday of every month at the Middle River Recreation and Parks building (Victory Villa Community Center), 404 Compass Rd., Baltimore, MD 21220. Phone 410-887-0258. During the summer months we have a mini no-digging hunt for tokens starting at 6:30 PM on the Victory Villa grounds to get members involved. Prizes are given for various token coins found. Regular meetings start at 7:00 pm when a call to order will be issued and the Club agenda will commence. It's a good idea to come a little early to get oriented. We are an active club with monthly club outings throughout the year at various parks in Baltimore City and County, sometimes to parks farther away. Typically, members meet at a park for a few hours of hunting and getting to know each other. Each outing is announced via our member email list and at the meetings. Impromptu hunts are initiated by member-to-member communication. At our meetings members compare detectors, talk about good sites, compare finds and share detecting tips. Talks are given during the meeting on various subjects such as detector tips, tools, maintenance, permissions, finds, relics and new equipment. You will always find some really unusual artifacts laying on the display board. Silver coins are awarded to members for best finds in various categories. A variety of drinks and snacks are present at Club meetings for guests and members to enjoy during the break period, often more than can be consumed. Come as a guest and you decide. We have membership forms at our meetings.